Call: (608) 792-7641 to register. In this workshop, students will learn and create a collage mini quilt with photo images and words on cloth to delight and inspire. We’ll begin with images of birds, nature and/or angels that Mary Lee provides for the group. 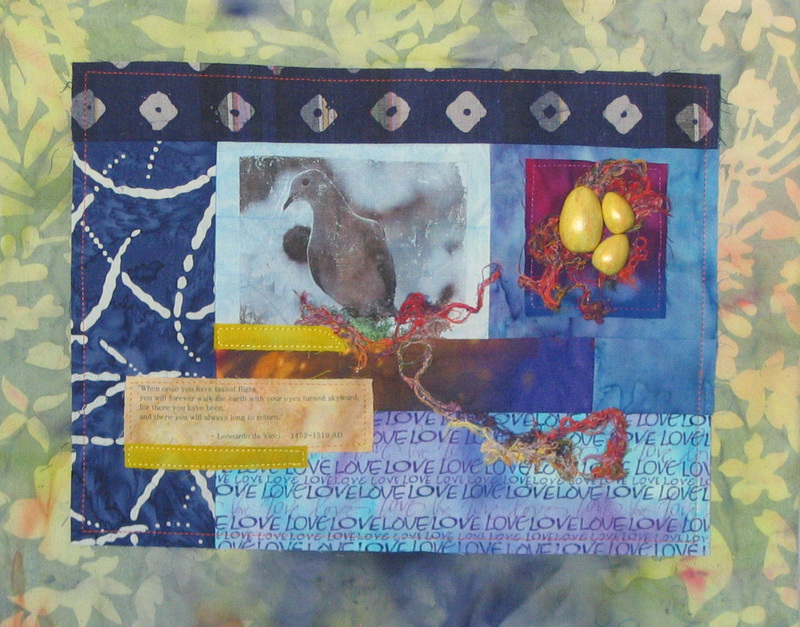 Images and text on cloth will be provided to give lots of possibilities for the creation of each personal mini quilt. We will consider and discuss composition, color, and placement to give dynamic or calming effects depending on the creator’s desires to support the creating. As in a quilt, we will have our top cloth with images and words, a middle batting cloth and at back piece of cloth. Putting it all together will be with hand stitching—no need for a sewing machine for this project. We’ll also create a miniature hanging devise to hang your mini art quilt on the wall. All materials provided—you may bring a notebook for any personal notes, favorite art supplies such as pencils, colored pencils, scissors, fabrics, or trims, if you choose. Mary Lee Eischen is a fiber and mixed media artist. She dyes and paints on fabric, and creates art quilts. She uses nature, women, family, color, and abstraction in her mixed media artwork. See more of Mary Lee’s art at her on line gallery at Breeze on my Skin, or at the Lanesboro Arts Center in Lanesboro, Minnesota or Bluff Country Artists Gallery in Spring Grove, Minnesota.